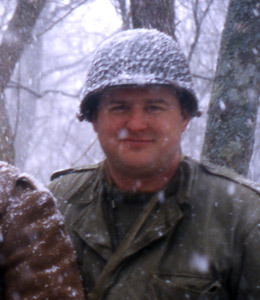 For the last few years, I have been bothered by the fact that I had become the very thing I had for many years ridiculed....an old, fat reenactor. Years of 2-3 hour commutes, sitting behind a computer 40-50 hours a week, and little exercise had taken their toll. I could tell that my weight was affecting my ability to participate in events... I was easily out of breath, my knees hurt, I couldn't run much at all, it was hard to carry the weight of my gear...and at one WW1 event, I almost couldn't get out of the trench! ...and the most vain of problems...I no longer looked anything like a combat soldier....round faced & somewhat bloated. Ok, I know, there aren't many 40 year old soldiers in WW1, WW2 or VN...I can't change that...but I can fix the weight problem. On January 1st 2007, I weighted in just shy of 270 pounds. I decided that I had to do something... I needed to lose weight, but at a reasonable pace and by making changes that I could live with. The photo on the right was taken in Febuary of 2007. I was already down around 260, but it still gives you an idea of the situation. Take a look at the Fat Rants on At the Front's website. Over the years, I've disagreed with some of Rollins's views, but he's 100% on target with many of his observations of the obesity of Americans today. I did not use his site to plan out my weightloss, but I did enjoy reading it for ideas and inspiration. Lots of guys can get a good initial weight loss by just cutting out sugary sodas. Unfortunately, I've been drinking diet softdrinks for years. HOWEVER, due to long hours commuting, I had developed a habit of eating Taco Bell for 2 meals a day...at least 2-3 days a week! So, that's where I started. Cut out the fats, cut down the intake, and start to exercise. By cutting out Taco Bell (and buffets) and bicycling for an hour a couple of days a week, I was able to drop to 250 pounds. Better, but not good enough. I knew I didn't want to attend meetings, eat weird diet MREs that were delivered thru the mail, cut out all carbs or any other radical changes that I couldn't live with for the rest of my life. A good friend of mine experienced good results with WeightWatchers. 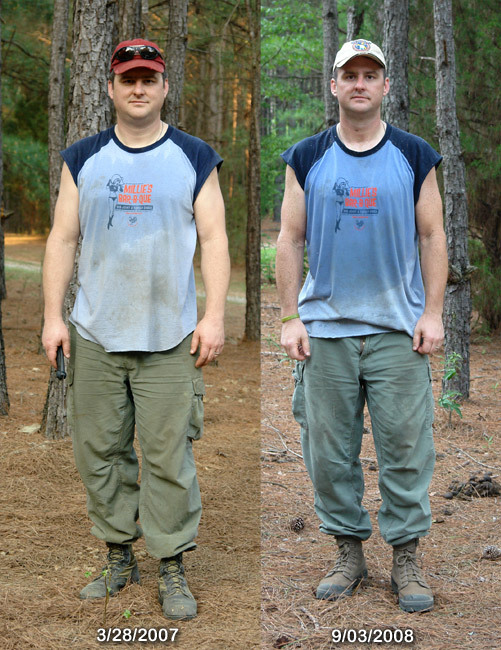 He lost 50 pounds without adding any exercise! So, I decided to give WeightWatchers a try. From what I could see, it just taught you to limit your intake & improve the quality of what you eat. Also, you could earn extra "points" by engaging in physical activity! I started WeightWatchers online for Men "Flex Plan" in April of 2008, and am still on the plan. My low weight during the summer of 2008 was 215, and I'm holding at about 220 during the winter. When I'm able to go back to regular bicycling this spring, I'll drop back to my summer weight. My weight last summer was 20 pounds heavier than I was in high school, but my winter weight is roughly the same as my weight during my freshman year in college...in 1987! During the summer, my wife & I ride bicycles 2-3 days a week and once on weekends. The usual distance is 25-30 miles during the week & 45 miles on weekends. During the winter, I try to ride 45 minutes to an hour on the stationary trainer. We've found that bicycing gives some of the best results for us... you can ride longer than run or walk...and you get crazy amounts of WeightWatchers points for it! (a three hour bike ride in the summer doubles my points for the day!) My primary road bike is a Novara brand from REI, and my wife's primary bike is a Scattante brand from Performance Bike. Both the Novara & the Scattante are "house brand" bikes...saving money on name brands while still getting good components. The photo below shows the final result of my attempt at Improving my Impression. 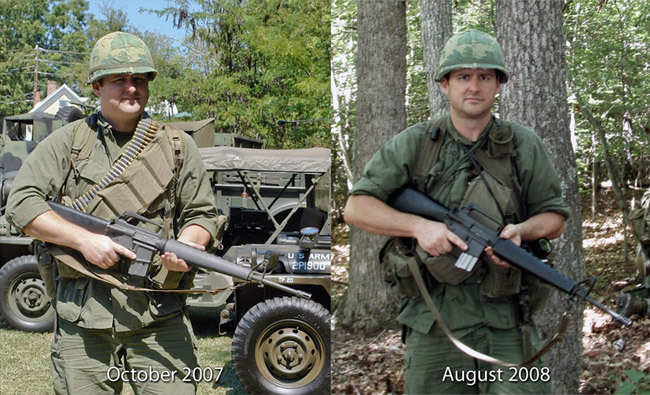 I'm wearing the exact same uniform & equipment in both photos. The weight different between the two photos is at least 35 pounds...maybe more. My winter weight meets the Army Weight Standard for my age (220 lbs), last summer's weight was within the max weight for age 28-39, and I'm hoping to meet the age 21-27 standard next summer. I have to say, it may not be the cheapest or the quickest way to improve your impression, but I think it's a VERY important part of portraying a combat soldier....and well worth the work.